Bring on your drilling projects - any size, any complexity. From simple one day projects to complex, multi-faceted extended drilling programs, you can count on your team at Holt Services, Inc. to do what it takes to complete your drilling project on schedule, to your specifications, and with your total satisfaction. You get the equipment, experience and benefits of a large company with the dedicated, personalized service of a small company. Your success is our priority before, during, and after your drilling project. You can count on Holt Services to treat you right. We take care of you on every project to earn your trust and the opportunity to take on your next project - whether that's next week or next year. You will work with experienced, knowledgeable drillers who run your project with a friendly can-do attitude using state-of-the-art drilling equipment, backed up by an experienced management team with the authority to solve problems quickly. Need a quick turnaround? 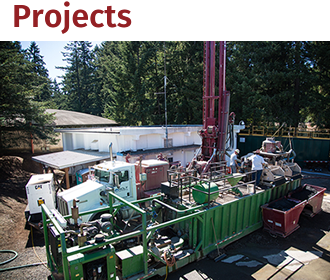 With 25 licensed drillers on staff and the largest fleet of the most diversified drilling equipment in the Pacific Northwest, your project can be underway soon. Contact us today to discuss or schedule your project. Serving Washington, Oregon, Idaho, Montana, Alaska, California, New Mexico, and beyond. 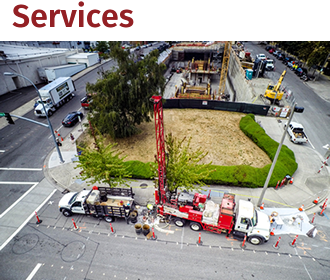 Our specialized equipment and depth of expertise in environmental drilling, geotechnical drilling and clean water drilling enables us to complete your project at competitive pricing well beyond our home state of Washington. Contact us today for an estimate or to talk with a drilling professional about your project. Holt Services is testing the embankment soil at Foster Dam as part of an annual investigation into the safety of the dam's foundation. Now Licensed to Drill in 8 States! 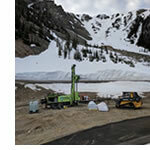 Our crews are now drilling in Utah. 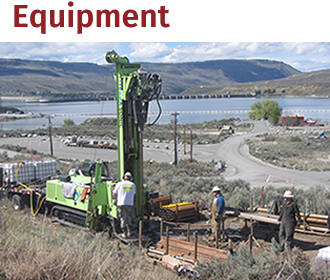 We have multiple large-scale environmental, geotechnical, and water supply projects in Utah, Idaho, and Montana in 2018.